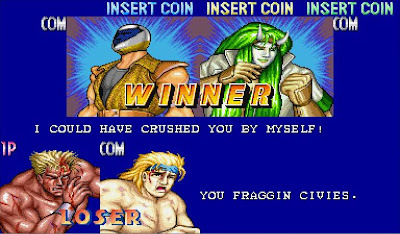 The above is taken from the arcade version of Capcom's Saturday Night Slam Masters (AKA Muscle Bomber: The Body Explosion). Long before I seriously considered starting up a blog, I had already made up my mind that, if I ever did have a blog or website, I would name it "Fraggin' Civies," after Gunloc's losing quote that had so baffled and enthralled me. At the very least, I might have used it for my MySpace quote. Then, on April 16, 2007, the Virginia Tech massacre happened, and in the face of that tragedy, for the first time it occurred to me just how badly "Fraggin' Civies" could be misinterpreted. Of course, Gunloc could not possibly have meant anything involving shooting civilians--that interpretation made zero sense in context--but I could not risk being so misunderstood. The expression was no longer safe for casual use. Truthfully it never had been, though I had been too dense to see it before. I would not start this blog until more than a year later. You might think that that would have been enough time to come up with something new, but those who have been around since the beginning of this may recall that, for the first few weeks, I had just "blog" as a placeholder title. Even now, I'm not altogether satisfied with what I finally settled upon. In my heart, I still think of this as "Fraggin' Civies," and I continue to dream of a world where the expression need not instill panic nor demand a defense. If "Fraggin' Civies" is what you want, "Fraggin' Civies" is what you should get. I actually like your blog title because it's rather expressive of the content of your blog. And when it doesn't accurately express the contents, it seems even more appropriate. Plus, whenever people ask you, "What is a man?" you can just say, "Look at my blog." You may remember that in my very first blog post, I discussed the origin of my blog title and even acknowledged that it might not stick, and suggestions might be solicited. So far, it works, but I was never too enamored of the title. Truth be told, I went with "Czardoz Contra World" because its inherent ambiguity provoked me to write an entry. By that standard, it may have been the best of titles.